Are you loyal to your team even though you may not live near your team’s home city? Have you recently re-located to a new town? Do you travel frequently and trying to find your team’s game shown at your hotel bar is problematic and unreliable? Are you a social person that would rather watch the game with other fans like yourself? If you answered yes to any of the previous questions, Team Bar Finder is for you. There are literally thousands of Team Bars and locations that host watch parties for fans of teams that are not located in their favorite teams’ home market. Watching a game with other fans of the same team creates an atmosphere and environment of that feeling of being back home rooting on your favorite team even if you are miles away. Until now, finding these team bars has been difficult, unreliable and time consuming. Team Bar Finder eliminates all of that. Team Bar Finder is simple to use. You’ll first register an account with Team Bar Finder. Choose your favorite teams from major sports – Pro Football, College, Pro Basketball, Pro Hockey, Pro Baseball and Football (Soccer). You can select just one team or multiple teams across all sports. Add, deleted and edit your favorite teams at any time. The dynamic mapping operation has three functions. The default view shows all team bars in a specific location, no matter what team affiliation or sport. 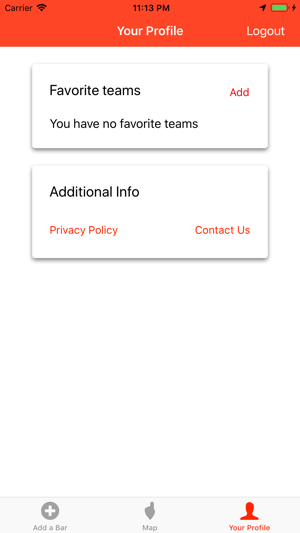 Select the “My Teams” tab and every location not affiliated with your team will disappear, leaving only those team bars that will be showing your favorite teams’ games. The search bar and “Team Name” tab allows you to type in a team name to search for team bars of a team not designated a favorite. Zoom into the region where you would like to watch the game and select the location you prefer. Once you have found a location you would like to visit, touch the team bar finder icon to open the details page. There you will see the name of the establishment, which team or multiple teams they support, the address, phone number and the ability to get driving directions using Maps. Because the bar and restaurant industry is volatile with locations closing unexpectedly or new management choosing to not host a specific fanbase, it is best to contact the location prior to your arrival. This ensures your game will be shown with sound and other like-minded fans gather there regularly. Some locations are strictly 18 or 21 and older spots. If you will be bringing underage fans to watch the game, make sure your location does not have age restrictions prior to going there. With so many team bars opening and closing, it is nearly impossible to keep up with all the changes. That’s why we have included the “add a bar” function. Tap the plus sign to add a bar and alert our staff of a location that may not be in the Team Bar Finder database. There you can list the establishment name, address and which teams’ games they show. You can even include additional details like, “they play the fight song after every touchdown” or “2-for-1 drink specials for fans wearing silver and black”. Once submitted, our team will verify the location details. If the location is confirmed, the bar or restaurant is added to the expansive Team Bar Finder database. 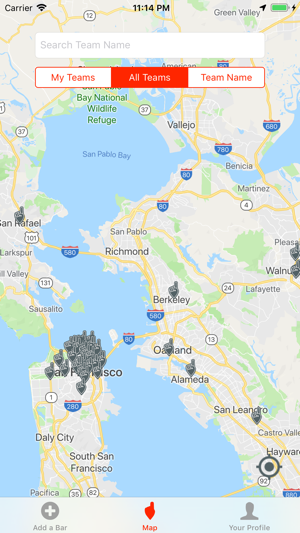 No matter if you are a season ticket holder and want to catch a game in a different city with fans like yourself or you have moved away and remain loyal to your team, Team Bar Finder can help you find your happy place. Sports fans share a special kinship that is social in nature. Watching your team with other fans makes it more enjoyable, regardless of your distance from your college or team’s home town. Team Bar Finder brings sports fans together with a common rooting interest. Download the app now and start finding your happy place. 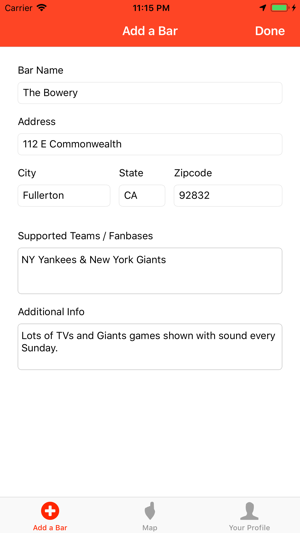 This is a great app for sports fans whose favorite team may be in another location. I wish I had this app when I was away at grad school. It would have been great to watch my favorite hometown sports teams amongst team friendly fans cheering them on... This app allows me to enjoy my favorite teams in team friendly locations no matter where I am. So cool! Now I can find a place to watch my team no matter where I am. Being able to watch an Oklahoma Sooners game with other Sooners fans is just like being back in Norman on Saturdays. I’ll be packing my OU hat when I travel and I can now find a Sooners bar anywhere I travel. BOOMER! When looking for a bar to watch my team, it took forever looking on message boards or social media. Now I have all my teams saved and can find a place to watch the game with other fans. So cool.